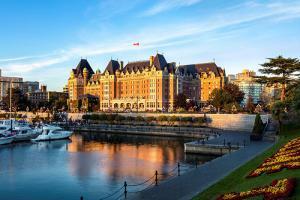 This charming hotel is located in Victoria's beloved cultural city center. A local favorite for dining experiences with a variety of restaurants, a visit to Victoria is only complete with world renowned Afternoon Tea. Enjoyed by royalty, celebrities and dignitaries, unwind, relax and enjoy the celebrated teatime experience. The hotel features full-service spa experiences at Willow Stream Spa, regarded as one of the best spas in Canada. The hotel features 477 luxuriously appointed non-smoking guest rooms and suites, with magnificent views of the city, garden, courtyard or the spectacular Inner Harbour. Located about 30 minutes away from Victoria International Airport. The Bengal Lounge, The Empress Room, Afternoon Tea, The Veranda. Inner Harbour, Royal BC Museum, The Pedaler Cycling Tours.